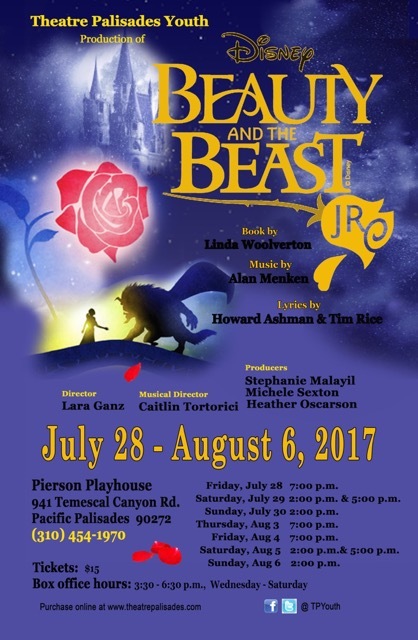 Theatre Palisades Youth invites you to “be their guest” for a special presentation of Disney’s Beauty and the Beast Jr. opening July 28th at Pierson Playhouse in Pacific Palisades. Forty members of the youth theatre group are getting ready to tell the tale of an adventurous young girl and a prince trapped under a spell who find that the power of love can overcome any evil. This 90-minute Jr. version of the musical is specifically designed for young talent, and is based on the 1994 Broadway production and Disney’s 1991 animated feature film. Director Lara Ganz (along with musical director Caitlin Tortorici) helms the production. Ganz studied musical theater at AMDA in NYC, has a psychology degree from UCLA, and is currently studying to be a children’s drama therapist, which is how she became Youth Director for TPY. After volunteering at the theater to gain experience working with children, she was asked to step into the position when the previous director was ready to move on. So how does a director bring a beloved Disney musical to life with a cast of children? Ganz lets us in on the behind-the-scenes workings in this charming interview. Lara, I know you have limited rehearsal time for the show so how do you put it all together so quickly? We have to be very creative in how we use our time. Our actual rehearsal period is only two full weeks of rehearsal and one full week of tech before we open. There are 40 children in the cast and we have TRIPLE cast this show. 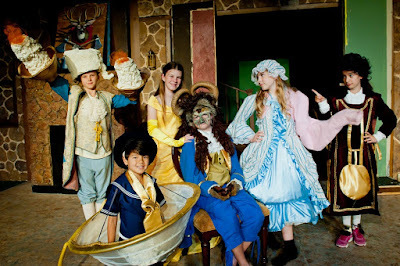 With nine performances, each child will have three performances as their featured character and six shows in the ensemble. Essentially, they are all learning the parts for TWO shows in two weeks. We held auditions and callbacks in April/May and the actors were given scripts and CDs of the show music in May, once cast. Our unorthodox process requires that they know their music and be off-book BEFORE we begin on day one. Children have such great imaginations. How do you help them create their characters, especially when some of them are objects like teapots, a candelabra, and a wardrobe? I use my drama therapy background to inform the way I teach the children. They get character homework before we even start rehearsals consisting of the usual “who, what, why, etc.” I give them sensory exercises and have them experiment with the character’s walk and movement style. They write about a day in their life and then a day in the life of their character. I also have them write two “rant” monologues. One monologue is about something they personally want to exclaim and the second is to be written from their character’s point of view. They then share these with their group. What they created was unpredictable and brilliant. Specifically for the inanimate objects, we have done some improvised sensory work where they physicalize the stages of transformation, incrementally, from full human to inanimate object. Then they perform improvised monologues describing how the transformation affects their character emotionally. I ask them to tell us what their character is longing for that has been lost in the transition. I would imagine they are having a great time experimenting. The children are extremely enthusiastic about playing these roles and are completely engaged in the exercises. They get inspired by their cast mates and will try to one-up each other with our improv games, which only brings the level of creativity to new heights! It sounds like you encourage a strong team spirit in rehearsals. I agree to take big risks and not be afraid to fail or for my choices to fall flat. I understand this is an essential part of the sacred creative process. I agree to refrain from bragging and competitiveness because bragging makes other people feel bad and comparison kills creativity and is the thief of joy. Happiness is found when you stop comparing yourself to other people. I agree to leave my inner Simon Cowell at home. 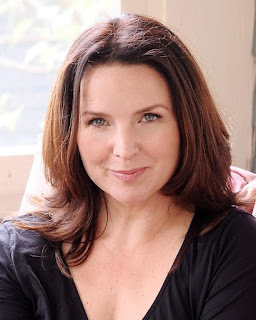 Harsh critics have wreaked havoc on many an inspiring actor, there is no room for harsh criticism of yourself and others in the creative process. I agree to be inclusive at all times while at TPY because that is how we will make new friends and demonstrate that TPY is a nurturing and supportive community. No one likes to feel like they are being excluded. Brilliant! Why did you decide to do Beauty and the Beast now? 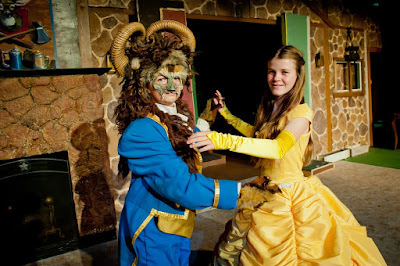 I have been surprised to learn how revered the story of Beauty and the Beast is in all populations! Adults, teens, tweens, “littles”-- people are SO connected to this show. It is thrilling. This was our most competitive audition ever. We had so many kids come out for the show I had to have callbacks, which is normally not necessary. I asked the children auditioning for leads to show me they could be prepared and professional. Every single child at callbacks was brilliant! I realized that I would need to reward their glorious efforts by triple casting the show. That creates an ENORMOUS amount of extra work for me and my musical and assistant directors (for no extra pay – we are a non-profit community theater) but these kids earned it! How is working with youth different from working with adults? I love working with both kids and adults. I am a more confident director with children. “In the land of the blind, one eye is king!” Children generally don’t have that self-conscious filter. You see it more in the middle school kids but, for the most part, they are so proud of and excited to share their ideas and creativity. It is MAGIC! What have you found to be most surprising about directing the show? TPY has never put on a “Disney princess” musical before. We try to avoid musicals that showcase one starring role and always look for ensemble based works. Ours is a developmental program and my mission is to use drama, music and dance to help guide ALL of the children in the program to find their true voice. I knew the kids in the community were really excited about the Disney live action version of the movie starring Emma Watson that was soon to be released so I reluctantly decided to look into the junior version while researching summer show options. The music, the messages, the characters were just too irresistible. I had chills and beautiful tears streaming down my face while envisioning the kids performing this sublime material. Beauty and the Beast life lessons? As a parent, I have learned that true grit and resilience are essential qualities for children to develop in order to be emotionally healthy. Belle and the castle servants model these behaviors so beautifully. She is miserable living in a small town where the people tend to mock and dismiss her as a weirdo but she finds a way to stay happy by escaping into her beloved books. Belle selflessly sacrifices herself to save her father from captivity and she then tries to make the best of the situation. The servants never lose hope that the spell will be broken. They also learn to care for each other and to make the most of their dreadful fate. These messages and others, -- like sacrificing for love and true beauty lies within -- are always important but, with the current political and social trends, it is imperative that these strong moral themes be absorbed by young people in order to help deflect the often confusing messages that infiltrate their lives. Through performing this story as well as being fully immersed in the safe and respectful creative environment we work to create at the theater, it is my greatest hope that these ideas will have been passed onto the children by the time we close this show.